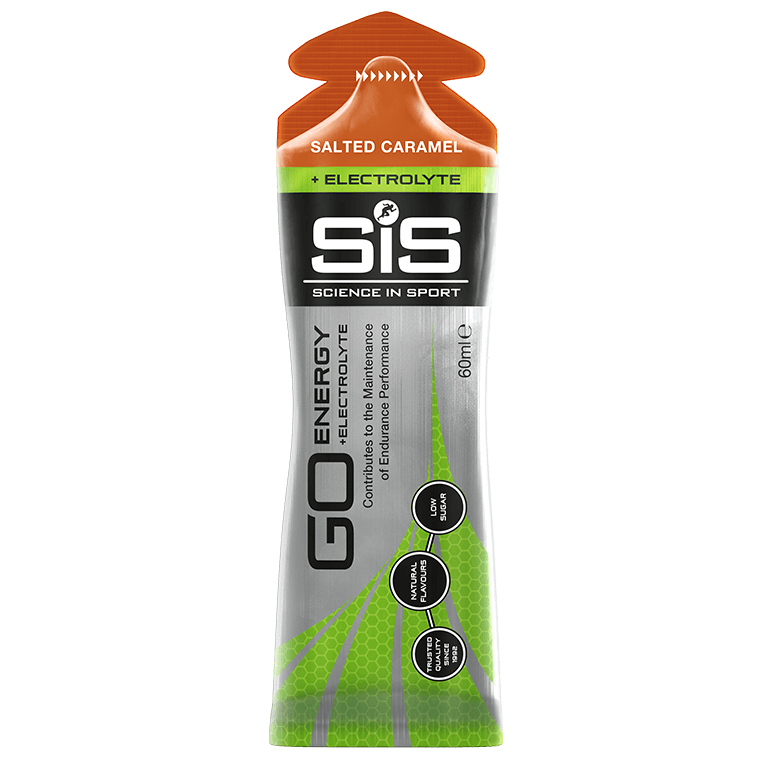 The GO Energy + Electrolyte gel (Salted Caramel) builds on the established science of the GO Isotonic Energy gel, the world’s first and only truly isotonic energy gel. The gel not only delivers a rapid supply of easily digestible carbohydrates (22 grams) for energy, but also provides 118mg sodium, 9.5mg potassium and 1.5mg magnesium per gel. Electrolytes including sodium, potassium and magnesium are lost through sweat and need to be replaced in order to help the body maintain fluid balance, alongside an appropriate fluid intake. Water, Maltodextrin (From Maize), Natural Flavour, Salt, Gelling Agents (Gellan Gum, Xanthan Gum), Acidity Regulators (Citric Acid, Sodium Citrate, Malic Acid), Sweeteners (Acesulfame K, Sucralose), Preservatives (Potassium Sorbate, Sodium Benzoate), Potassium Chloride, Magnesium Citrate. When should I have this versus your other gels? Aim for 1 x GO Isotonic Energy Gel and 2 x GO Isotonic Energy Gels per hour during exercise lasting over 90 minutes. 1 x GO Energy + Electrolyte Gel can also be consumed before exercise to ensure electrolytes are available for fluid absorption. Why do I need to have electrolytes? During exercise, electrolytes are lost through sweating and must be replaced in order to maintain fluid balance and prevent dehydration. The gels do not taste salty and are available in refreshing raspberry and lemon & mint flavours. The GO Energy + Electrolyte Gel is not isotonic as the addition of electrolytes increases the concentration. GO Energy + Electrolyte Gel contains natural flavourings. No, Gels do not contain aspartame.